“Speaking for the Women in my District” – Cultivating a Gendered Vote? How do electoral rules affect the representation of women’s policy preferences? Previous literature shows that more proportional electoral systems increase women’s numeric strength in parliaments (e.g. Norris 1985; Rule 1987), and that female politicians aim to promote women's issues (e.g. Bochel and Briggs 2000; Childs 2001). However, we wonder to what extent the electoral system itself also bears the potential to move the parliamentary agenda closer to women’s preferences – beyond its effect on descriptive representation. We find no evidence that certain electoral rules are particularly favorable for policy responsiveness towards women. In contrast to what we anticipated, our results show that parliaments elected with open list in small districts consider women’s policy preferences less accurately than their closed-list counterparts, which raises questions about the effect of the ballot structure on policy responsiveness towards women. Originally, we expected that parliaments deviate least from women’s policy preferences, if representatives face an incentive to attract votes from female citizens and try to cultivate a reputation as a promoter of women’s interests in parliaments. From Shugart and Carey (1995), we know how electoral rules influence the incentive to cultivate a personal vote: The value of personal reputation increases with growing district magnitude. In systems of proportional representation, the mechanical effects of electoral rules tend to produce a higher number of parties and reduce party system fragmentation (Sartori 1976; Lijphart 1994; Cox 1997). Moreover, the proportionality of the electoral system, exercises centrifugal forces on the party system allowing for more viable parties and providing incentives for small niche parties to compete (Cox 1990). As each party covers certain ideological aspects and parties spread over the ideological spectrum (Cox 1997), in permissive electoral system, parties show higher dispersion with regard to the electorate’s distribution of ideological positions (Dow 2010). However, this effect only holds for open ballot systems. Representatives elected on open lists care more about the personal reputation than about the programmatic orientation of their party. This enables voters to select those candidates that are closest to their stance even though the general party line might not be fully convincing and in this manner, leads to the election of legislatures close to citizens’ policy preferences (Walczak and van der Brug 2012). In contrast, in case of closed lists, voters will not be able to choose individual candidates and there is hence no additional value of personal reputation. If candidates have an incentive to cultivate a personal vote, resuming the role as promoters of women’s issues, – hence cultivating a gendered vote – is a promising strategy to win female voters. While the gender gap in turnout has been decreasing in some countries, many others still face disparities in participation between men and women (Norris 2000). Similarly, women are descriptively underrepresented in most countries. Hence, candidates might present themselves as advocates of women’s preferences to mobilize the female electorate. At the same token, this process would lead to a more accurate representation of women’s policy preferences, because a larger number of representatives speaks for women. To test this expectation, we consider 20 European countries. With data from the European Value Study (2008) we identify female citizens’ policy preferences with regards to free market, environment, immigration, multiculturalism, redistribution, religious principles and social lifestyle. We compare women’s policy preferences to those of the legislators as identified through the Chapel Hill Expert Survey (Bakker, et al. 2010) (which means they are identified using party programs). For that purpose, we adapt the concept of many-to-many congruence developed by Golder and Stramski (2010). Figure 1 exemplifies how this measure works using data on multiculturalism policy preferences in the Netherlands. The solid line shows the distribution of women’s policy preferences, while the dashed line displays the frequency distribution of MPs’ policy positions. We sum up the distance between the two functions for each policy position, which implies calculating the area between them. The larger the area between the two functions, the more do the policy preferences of parliaments and women deviate from each other. Further details on the measure can be provided on request. This measure of deviation between the policy preferences of women and parliament constitutes the dependent variable of all our models, while the district magnitude (Database of Political institutions by Beck et al. (2001)) and the ballot structure (Electoral System Change Project by Pilet and Renwick (2017)) constitute the explanatory variables. Beyond, our models consider a set of control variables, most importantly policy congruence between men and parliaments – which controls for all factors that should impact both groups equally such as the party systems, the share of women in parliaments (Inter-Parliamentary Union 2016), or the gender gap in turnout (European Values Study 2008). All models presented below are linear regression models with standard errors clustered at the country level. 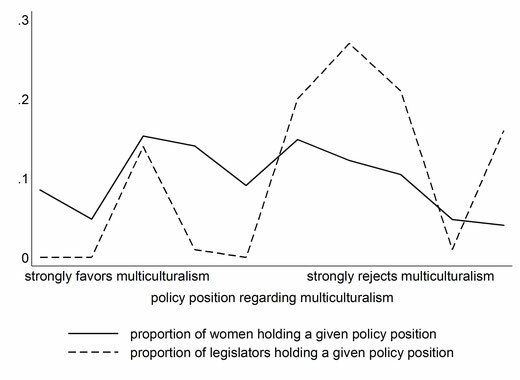 Figure 1: Preferences distribution of representatives and female citizens regarding multiculturalism. We present the findings of our linear regression in Table 1. The first take-away is that district magnitude on its own does not influence the accuracy with which parliaments mirror women’s policy preferences. In neither of the three models does the variable unfold an effect that is statistically significantly different from zero. Beyond, and rather surprisingly, open-list elections unfold a positive effect, which means they lead to more deviation between women’s and parliaments’ policy preferences. 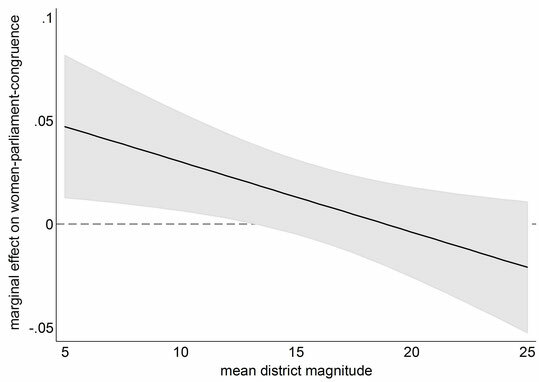 Yet, the negative effect of the interaction between district magnitude and open ballot structure indicates that as district magnitude increases, the picture changes. Table 1: Linear regression of women-parliament-congruence on electoral system variables. Annotations: a p< 0.15, * p < 0.10, ** p < 0.05, *** p < 0.01. ESCP means Electoral System Change Project, DPI means Database of Political Institutions, IPU refers to the IPU Parline Database, EVS is short for European Value Study. All models are simple linear regression models with standard errors clustered at the country level. Observations are policy areas nested in countries and the data set includes only those policy areas for which the policy preferences of men and women differ considerably. Figure 2 shows the interaction effect: While open-list elections cause more deviation in the policy preferences of women and parliaments in small districts, this effect becomes statistically insignificant if district magnitude is larger than circa thirteen seats. The effect does, however, not turn around in the light of the district size we observe in our sample. Figure 2: Marginal effect of open ballot structure on women-parliament-congruence depending on district magnitude. In a nutshell, if we hold the share of female legislators and voters constant, the electoral system itself does not unfold a positive effect on the accuracy with which parliaments represent the policy preferences of women. While more proportional electoral rules bear the potential to improve the share of female office holders – so-called descriptive representation – it thus seems to be without positive consequences for the representation of women’s policy preferences – substantive representation. Of course, there might be an indirect effect if female office-holders promote women’s issues, but there is not direct connection which might motivate both, men and women to cultivate a gendered vote. On contrast, we are rather surprised to find that countries who organize elections in small districts with open lists are significantly less likely to consider women’s policy preferences in parliaments than their closed-list counterparts. One explanation might be that candidates competing for personal votes seem not to recognize women’s preferences beyond traditional women’s issues (gender equality, abortion etc) as strategically relevant for electoral success. In contrast, parties themselves seem to be more aware of the potential of female voters and thus diversify their lists with candidates that also promote the preferences of women in small districts. Or, might there be another rationale behind our findings, that we have not considered thus far? Bakker, Ryan, Catherine de Vries, Erica Edwards, Liesbet Hooghe, Seth Jolly, Gary Marks, Jonathan Polk, Jan Rovny, Marco Steenbergen, and Milada Vachudova. 2010. "Measuring Party Positions in Europe: The Chapel Hill Expert Survey Trend File, 1999-2010." Party Politics 21(1): 143-52. Beck, Thorsten, George Clarke, Alberto Groff, Philip Keefer, and Patrick Walsh. 2001. "New Tools in Comparative Political Economy: The Database of Political Institutions." World Bank Economic Review 15(1): 165-76. Bochel, C., and J. Briggs. 2000. "Do Women Make a Difference? ." Politics 20(2): 63-68. Childs, Sarah. 2001. "In Their Own Words: New Labour Women and the Substantive Representation of Women." British Journal of Politics and International Relations 3(2): 173-90. Cox, Gary W. 1990. "Centripetal and Centrifugal Incentives in Electoral Systems." American Journal of Political Science 34(4): 903-35. ———. 1997. Making Votes Count: Strategic Co-Ordination in the World’s Electoral Systems. Cambridge: Cambridge University Press. Dow, Jay K. 2010. "Party-System Extremism in Majoritarian and Proportional Electoral Systems." British Journal of Political Science 41(2): 341-61. European Values Study. 2008. "European Values Study 2008: Integrated Dataset (Evs 2008). Za4800 Data File Version 3.0.0." Cologne: GESIS Data Archive, doi: 10.4232/1.11004. Accessed 15 April 2016. Golder, Matt, and Jacek Stramski. 2010. "Ideological Congruence and Electoral Institutions." American Journal of Political Science 54(1): 90-106. Inter-Parliamentary Union. 2016. "Women in National Parliaments." http://www.ipu.org/wmn-e/arc/classif311209.htm. Accessed 31 May 2016. Lijphart, Arendt. 1994. Electoral Systems and Party Systems. Oxford: Oxford University Press. Norris, Pippa. 1985. "Women's Legislative Participation in Western Europe." Western European Politics 890-101. ———. 2000. "Women’s Power at the Ballot Box.Voter Turnout from 1945 to 2000: A Global Report on Political Participation. For International Idea." https://www.hks.harvard.edu/fs/pnorris/Acrobat/IDEA.PDF. Accessed 22 February 2017. Pilet, Jean-Benoit, and Alan Renwick. 2017. "Electoral System Change in Europe since 1945 Database." Rule, Wilma. 1987. "Electoral Systems, Contextual Factors, and Women's Opportunity for Election to Parliament in Twenty-Three Democracies." Western Political Quarterly 40477-98. Sartori, Giovanni. 1976. Parties and Party Systems: A Framework for Analysis. New York: Cambridge University Press. Shugart, John M. , and Mathew S. Carey. 1995. "Incentives to Cultivate a Personal Vote: A Rank Ordering of Electoral Formulas." Electoral Studies 14(4): 417-43. Walczak, Agnieszka , and Wouter van der Brug. 2012. "Representation in the European Parliament: Factors Affecting the Attitude Congruence of Voters and Candidates in the Ep Elections." European Union Politics 14(1): 3-22.